So you’re ready to start beauty school. Yay! An education in cosmetology or esthetics can lead you down a path toward a creative future full of success! Before you grab your shears, tweezers, or clippers, you’ve got to do a few things. The first step in your journey to a future in beauty is an education! Here at Xenon Academy, we’ve taken our years of experience to perfect the admissions process in our school. We’ve created a step-by-step journey for you to follow to make things as easy as possible! We’ve even laid it all out when it comes to financial assistance options. Follow the steps below to learn how to become a Xenon Academy student! We want to hear from you, and we make it easy to get in touch. You can contact us in four different ways. Call Us. Give your nearest Xenon Academy a call! Our helpful staff members will be there to speak with you about the next step. GRAND ISLAND: (308) 210-4078 OMAHA: (402) 718-9853. Drop In. We’d be happy to see you whenever we’re open! Just drop on by. You can find us at 804 N. Webb Road Grand Island NE 68803 or 8516 Park Drive Omaha, NE 68127. Fill Out a Form on Our Site. Our homepage has a purple form you can find easily. Just submit your information, and we’ll do the rest! Fill Out a Form on Facebook. Once you’re on our Facebook page, contacting us is easy! There’s a blue “Contact Us” button right at the top! Admissions Tip: Not sure what’s going to happen once you submit a form or get in touch with us? We will give you a call (if we don’t have you on the phone already) or we’ll email you. During this time we’re going to give you more info about your program of interest, but the most important element of this call is setting up your private tour. This step will happen while you take step one. When you get in touch with us we’re going to take the time to setup a private tour of one of our campuses. Tours are the most important step in the admissions process! Seriously! Tours allow you to come in and check out our campus in person, learn more about the programs, meet students, get introduced to instructors and staff, and even sit down with a financial advisor. We encourage you to bring a friend or family member with you, and be ready to learn! What schedules are your programs offered in? Do you have financial assistance? What does a day in the life of a student look like? How long can I expect to be in school? What does the student kit include? Admissions Tip: Don’t be afraid to ask questions throughout the tour! The more info you seek the better we can help you get to know Xenon Academy! You don’t have to do this step alone! We have a Business Office that specializes in helping students figure out the financials of going to school. This part can be intimidating, but have no fear! Our staff has been doing this for a while, and we want to help you explore all of your options. What Financial Assistance Options Does Xenon Academy Offer? We’ve dedicated a lot of time to being able to offer a variety of payment options. Our staff can help educate you on all of the options that are available to you! Financial aid is available to students who qualify in all of our cosmetology or esthetics programs. If you’re interested in learning about financial aid, we can sit down and talk about it on your tour. We can help you fill out the FAFSA® (Free Application for Federal Student Aid) if you haven’t already, we can help you create an FSA ID, and we can help you pull applicable tax information. After the process is completed, we’ll sit down and go over what you may qualify for. You do have the option to pay up front and in cash. We know that this isn’t the most common way to pay for your education, but it is an easy way to get it done and not have to worry about it throughout the school year! If you’re interested in paying in cash throughout your time here, we can help set up payment plans for you. These will vary based on your ability to pay, your timeline for payments, and more. You’ll need to spend some time in our Business Office to figure out what’s best for you! Financial Tip: If you’re considering using financial aid* to pay for your education, there are a variety of benefits. Not only are interest rates low, but loans don’t have to be paid back until six months after you graduate! This can give you the chance to improve your credit! We accept all types of college saving plans! If you’ve been saving up for your education, we can accept what you’ve squirreled away. You don’t have to spend a college savings plan at a traditional college or university, you can use it at Xenon Academy! We accept outside scholarships and we offer internal travel scholarships for students who are commuting to Xenon Academy. You’ll want to come in and speak with us to learn more about using your scholarships at our school! If you’ve received a grant, congrats! Grants are a type of funding that you don’t have to pay back. They may come from a variety of sources. Check with our Business Office to find out more about using your grant for one of our beauty programs. Who Can Apply for Financial Aid*? Anyone who wants to find out if they qualify for financial aid* can go through the process! Yes, the amount you qualify for will vary, but don’t let that deter you. You might be surprised what you qualify for! Admissions Tip: We try to make it easy for students who are traveling to Xenon Academy. Talk to us about your commute to school! After you’ve figured out the most complicated step (financials) the next step is to actually enroll! If Xenon Academy is where you choose to pursue your education, you’ll need to sign a contract with us to get started. We have a contract to help keep you and us committed to our relationship. This goes over all the logistics of financials, attendance, and more. Take your time to read before you sign so you know what’s expected of you. Don’t feel intimidated, this contract is good for the both of us! Once you’ve signed on the dotted line, you can get enrolled in orientation! Your orientation day will set you up for your first day of classes. Orientation days are held two weeks before your actual start date. Step 4: Show Up For Your First Day! Come dressed the part. Wear the appropriate clothing. This includes your uniform (if you receive it at orientation), removing any jewelry that can get in your way, and making sure you have comfortable, closed-toe shoes. Be excited! If you want a career in beauty, we want to help you make that happen. This will take dedication from both of us. Find a friend. Beauty school is much more fun with friends. Get ready to make friends, work together, and collaborate. 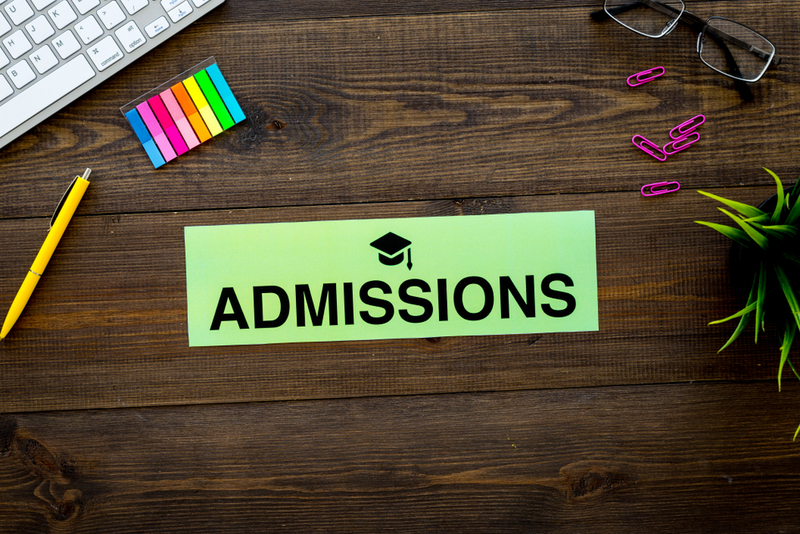 Admissions Tip: Stick to your appointments! Set a precedent for your education, try your best not to miss any appointment dates that are set, and always follow directions. You’ll be more successful if you make sure your first few interactions with education are good ones! What are you waiting for? Follow our step-by-step guide and get going! If you need a reminder of how to contact us, we’ve listed our contact info again below. We can’t wait to help you throughout your journey to a career in beauty!